Clarksville, TN – In a dominant performance, Austin Peay State University (APSU) men’s basketball team controlled every aspect of the second half and turned a close contest into a lopsided affair in a 95-68 win against Purdue Fort Wayne, Saturday, in the Dunn Center. Austin Peay (6-4) survived early foul trouble to key components of a still-shorthanded lineup to take down Purdue Fort Wayne (6-7) for the first time in program history—the same Mastodon squad which beat Ohio Valley Conference foe Eastern Illinois by 44 points back on November 28th. Call it a post-exam malaise, call it whatever you like—shot-making was a chore for both teams in the early going, with the teams hitting just five of their first 18 shots and Austin Peay’s Shotmaker-in-Chief, Zach Glotta, hitting the bench early in foul trouble. But where others might struggle to fill a void from the outside, the Govs simply turned to Terry Taylor. The sophomore responded with 18 first-half points, shouldering the load while the rest of the team might’ve been struggling—at one point, Taylor was 5-of-8 from the floor while the rest of the Govs sat at 3-of-10. As the Govs began to heat up, the Mastodons went cold, failing to make a shot from the floor for over six minutes in the first half. And even when the visitors made a run, Glotta made sure to send the Govs into the break on a high note, beating the buzzer with a three to take a 46-39 lead into halftime. The Govs jumped out to a 20-8 run to open the second half and never looked back. Sophomore Dayton Gumm energized the crowd on back-to-back possessions, getting a fast-break layup to drop and then stepping back for a three-pointer to put the Govs ahead by 13—the lead never reached single digits again for the game’s remainder. If Taylor was shouldering a load in the first half, he was joined on the block and in the scoring column for much of the final 20 minutes by grad transfer Jabari McGhee. The Albany, Georgia native scored 12 of his career-high 20 points in the final frame, including five during the half-opening run and five over the final 4:40 of play. The Governors imposed their will on the glass, particularly on the offensive end of the floor. 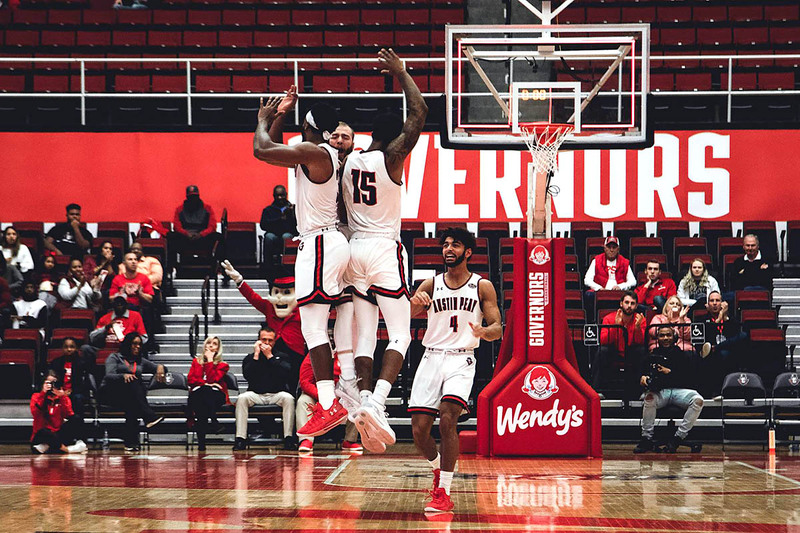 Austin Peay’s plus-15 rebounding advantage (43-28) was its largest against a Division I opponent since January 6th, 2018 (against Southeast Missouri), with 17 offensive boards leading to 19 second-chance points. The Govs have accrued 38 combined offensive boards in the last two games, and are at plus-47 overall in rebounding margin over the last three games. The win was Austin Peay’s first in five attempts against Purdue Fort Wayne and its first against a Summit League foe since 2000. Taylor and McGhee are the first Govs to score 20 points in the same game since Taylor (25) and Averyl Ugba (23) in the semifinals of the 2018 OVC Tournament semifinals against Belmont, March 2nd, 2018. After securing a program-record 23 steals in the last contest against Calvary, the Govs did not earn their first steal until the 14:57 mark of the second half. In addition to a career night in the scoring column, Taylor equaled his career-high with 14 field goals and dished out a career-best five assists. McGhee entered the contest hitting 40.0 percent for the season; after his 7-of-8 performance from the floor, he’s improved to an even 50.0 percent (19-of-38). Senior Chris Porter-Bunton finished with 13 points, his fourth double-digit scoring effort in the last five games. As a team, the Govs are shooting 52.7 percent (99-of-188) over the last three games. Taylor set Austin Peay season-highs in points (32), field goals made (14) and field goals attempted (22). Grad transfer Jarrett Givens reached double figures for the fourth straight game, finishing with 10 points; he’s averaging 12.0 points over that stretch. Glotta has recorded 15 steals over the last four games—a full one-fifth of his career total (75). The Govs begin the home schedule 3-0 for the first time since 2005-06. Austin Peay owns a plus-39 turnover margin over the last five games, including a plus-five showing against the Mastodons on Saturday. The Govs have won four straight for the first time since January 25th-February 3rd, 2018. Austin Peay is now 3-0 to start December for the first time since 2009-10. Austin Peay is outscoring opponents 30.3-13.3 off turnover the last four games. Senior Steve Harris posted a career-high six assists. Matt Figger picked up his 25th win as Austin Peay head coach in his 44th game at the helm, the fastest Governors men’s basketball head coach to 25 wins since Lake Kelly (42 games). A return trip to south Florida and a rematch with Campbell awaits the Govs when Austin Peay travels to St. Petersburg, Florida to take on the Camels in the St. Pete Shootout. Tip-off is scheduled for 1:30pm, Friday, December 21st.